After their successful first concert last December of 2012, the boys of B1A4 will be holding their second solo concert this coming August. 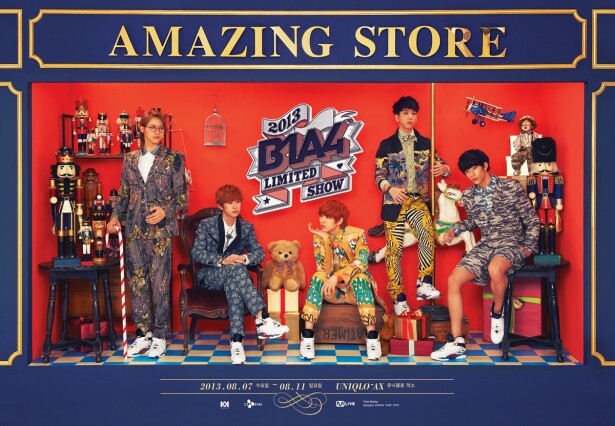 According WM Entertainment, the group will be having their second concert titled ‘AMAZING STORE’ at the Uniqlo AX from August 7 to 11. Under the story telling concept, the concert will be decorated with toys, presenting a whole new concept. Having transformed themselves into the musicians, B1A4 will re-arrange every the song for the concert in band version and they will be performing with a live band, presenting a new kind of music. Tickets for the concerts will be available from June 27th, 2013 at 8PM KST. Meanwhile, B1A4 wrapped up their promotions for fourth mini album, ‘What’s Happening?’ due to Baro’s ankle injury.